Good for the Mexican people – by breaking from supine subordination to the US, and opening up the way to national dignity and development, which can only be based on the working people of Mexico, the country can begin development and break with the wasted, corrupt and disastrous years created by right wing governments. Confirms that both the left and right have very deep social roots in Latin America and the struggle between them will be intense for prolonged period. The claims made by the right wing, that setbacks for the left in other parts of Latin America such as Brazil and Argentina represent a ‘sweeping wave to the right’, are shown to be false. This victory in Mexico will aid left wing governments throughout Latin America – including Cuba, Venezuela, Bolivia and Nicaragua – and those fighting against the anti-popular and anti-democratic attacks in Brazil, Argentina and other countries. 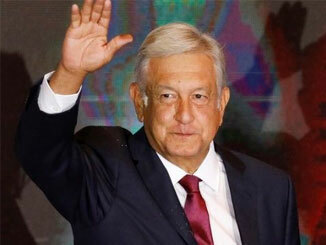 It is crucial that a new left wing government in Mexico develops an adequate economic policy, as it is faced with slow growth in the Western economies and this was the Achilles heel of some left wing governments in Latin America. This means above all studying the rapidly growing economies of China and Vietnam in which state investment plays the decisive role in driving the economy. The US will not respect the democratic decision of the Mexican people and attempts to create problems for the new government will start immediately and this demands solidarity from the left throughout the world – the situation in Mexico will inevitably become intermingled with Trump’s racist and economic attacks on Mexico so a particularly great responsibility lies with the US left. Solidarity with the people of Mexico in their victory!